Unsecured business loans for startups are rare because lenders typically require collateral. Before applying, you should understand how unsecured business loans work, what your options are, and how you can qualify. The rates and terms on these types of loans are wide-ranging, with APRs between 10% and 30% and terms up to three years. If you need an unsecured business loan, contact Guidant Financial. They specialize in getting startups funded and can help new businesses obtain unsecured business startup loans, SBA loans, and use 401(k) funds without paying penalties or taxes. They offer a free, no obligation consultation. Traditional lenders, like those who provide SBA startup loans, typically require business owners to pledge collateral—like real estate—in order to get approved for a business loan. With unsecured startup business loans, your business is typically approved based on your personal credit profile and business performance rather than collateral. However, you’ll likely need to agree to a UCC lien on your business assets and provide a personal guarantee. Directly pledge business assets: A UCC lien covers all business assets like equipment, accounts receivable, and inventory. You are pledging these business assets and your lender can go after them in the event of a loan default. Provide personal guarantees of owners: If your business doesn’t pay back the loan as agreed, you will be held personally liable for paying back the loan. Indirectly pledge personal assets of owners: The lender can potentially use the personal guarantee to indirectly pursue your personal assets to recoup losses in the event of default. However, some states limit the recourse and number of actions a lender can take. Unsecured business funding for startups typically costs more than traditional loans because the risk is higher for the lender. With a traditional loan from a bank, you can expect to pay 5% to 10% in interest every year, but with an unsecured loan, the interest rates can be double, or more. Founders still favor unsecured business loans for startups because they either don’t have collateral or don’t want to risk their personal assets. Depending on the type of financing you are getting and the lender you work with, your terms and minimum qualifications will vary. However, you can expect that as loan terms get longer and loan amounts get larger, lenders will have higher minimum qualification requirements. The exception to these ranges is an SBA loan. These loans typically have longer terms, between 10 and 25 years, and rates between 5% and 11%, as well as larger loan limits. However, they are far more difficult to qualify for than some other unsecured startup business loans. 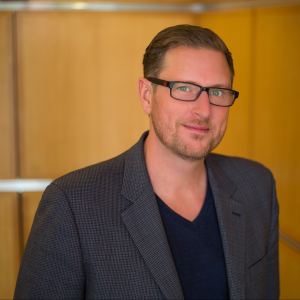 For SBA startup loans, approved lenders adhere to their own lending standards. This means that an SBA loan typically requires you to be a prime borrower with a 680+ credit score. Additionally, it will often require collateral, and at the very least a personal guarantee, but in exchange, you’ll typically get longer terms of 10 to 25 years and low rates typically ranging between 5% and 11%. Most unsecured lenders will ask you to sign a personal guarantee. This means that in the event the business isn’t able to repay the loan, you can be held personally responsible for repaying it. Very few lenders, regardless of the type of loan you’re getting, will originate an unsecured loan without asking you to first sign a personal guarantee. There are a few options in the market today for unsecured business loans for startups. Funding a startup is risky because there is no proof that you’ll succeed. Typically, a lender wants collateral to secure their interest in your business, and it can be more difficult to find an unsecured startup business loan. Many startups end up with the wrong financing for their business, which can create a strain on their company for years to come. 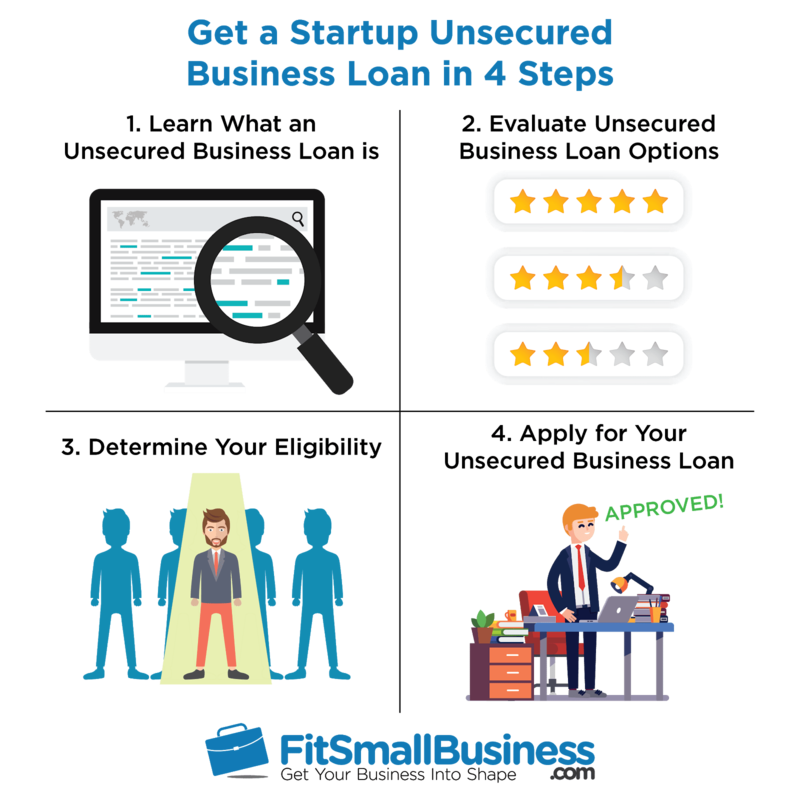 In order to get the right unsecured business loan for your startup, you’ll need to evaluate all of your possible options. These options really only include personal loans and credit cards, although technically you might be able to get an unsecured SBA loan (but it’s not likely). An alternative option to these unsecured debts is to use a ROBS; we discuss it further below. Personal Loans Borrowers with 680+ credit scores who only need up to $50k in financing. Business Credit Cards Every startup’s financial toolkit. Credit lines will typically be less than $20k. SBA Loans Prime borrowers needing long-term capital who have 25% - 30% to put down. ROBS Borrowers with $50k+ savings in a qualifying retirement account wanting to avoid debt. Many startups are forced to find financing by only using their personal credit profile because the business either doesn’t yet exist or has very little revenue. Personal loans are commonly used for startup funding because they are smaller loans with competitive interest rates, but you’ll be on the hook personally if the business is unable to pay the money back. When you take out a personal loan, you’ll sign a personal guarantee that will put all of your personal assets at risk, including your personal home. While this sounds like you’re using collateral in this type of funding arrangement, your assets don’t factor into the approval of your loan. Instead, they’ll look at your personal credit profile and how you plan to spend the money. Loan limits typically don’t exceed $50,000, and you’ll typically need a 650+ personal credit score to qualify. The best startup business credit cards are easy to access and can be a cost-effective, unsecured business loan for your startup. Many small business credit cards come with rewards that pay you for using your cards every month. For example, you could receive up to 5% cash back on office expenses. Getting approved for up to $20,000 requires that you have a good credit score of at least 680, with higher limits available for established businesses. You only pay interest on what you owe at the end of your billing cycle, so if you pay off your card every month, you won’t be charged anything for using the credit line. Some cards come with an annual fee, and you should make sure you understand any potential fees before you apply. While not recommended, business owners sometimes use “credit card stacking,” through a provider such as Seek Capital, as a form of unsecured financing. Credit cards are likely the first form of financing you’ll be approved for, and if you have strong personal credit, they should probably already be a part of your financial toolkit. Our credit card marketplace can help you find the best credit card for everyday purchases or unexpected expenses. SBA loans are one of the most sought-after small business loans because of their low interest rates and long repayment terms. They’re a good fit for working capital to help grow your business because they typically have repayment terms of 10 and 25 years, with SBA loan rates between 5% and 11%. However, SBA loans are difficult to qualify for, especially if you need unsecured business funding for a startup. Remember that when you get an SBA startup loan, you have to satisfy both SBA loan requirements and the requirements of your lender. Typically, the SBA requires that all approved lenders take all available collateral—both business and personal—up to 100% of the loan amount. This means that while the SBA doesn’t specifically require collateral if you don’t have it, your lender probably will. There are many types of SBA loans, but each follows a similar application process that requires a lot of documentation and can routinely take 45 to 90+ days to get approved and funded. It’s important to be prepared for an SBA loan before you apply so that you can help speed up the application process as much as possible. You can learn more by reading our article on how to apply for an SBA loan. We consider a ROBS to be the best-kept secret in unsecured business funding for startups because it’s not a loan, and there are no weekly or monthly payments that saddle your company with debt. Instead, a ROBS helps you get access to funds in a tax-deferred retirement account, without paying early withdrawal penalties or taxes to be used for business purposes. It’s a valid alternative to an unsecured startup business loan. A ROBS is a really flexible piece of financing that can be used to start, buy, or grow a business. These funds can also be combined with other financing, e.g., as a down payment for an SBA loan. Plus, your credit won’t be checked with a ROBS because there are no traditional minimum qualifications. You’ll just need to abide by all the legal rules that come with a ROBS. Since a ROBS can be a complicated transaction, we recommend you work with an experienced ROBS professional who can help you make sure you abide by all the legal rules. Our recommended ROBS provider, Guidant, can work with you if you have $50,000+ in a tax-deferred retirement account. Setup a free consultation to learn more. Lenders offering unsecured business loans for startups don’t have a lot of information to go off of in order to determine if you’re qualified for a loan. The biggest factors determining if you can get unsecured business funding for your startup are going to be your personal credit score (and the credit score of other business owners), your business plan, and how much money you have to contribute to your business. The personal credit scores (check yours for free) of all business owners are vital in getting approved for any unsecured startup business loans. This is the lender’s best idea of how secure their money will be in your hands until you pay them back, because your credit score is a reflection of your financial responsibility. If you have a low credit score (below 650), then you could find yourself being automatically rejected by lenders as they process your application. Since your credit score is key to getting approved, you should make sure you check your own credit score in advance of applying to see if you qualify. If your credit score is lower than expected, then you may be wasting your time and money by applying for unsecured small business startup loans. You can also take the time to build or repair your credit if you know what it is in advance of applying. The lower your credit is, the more costly your unsecured startup loan will likely be (if you’re able to get approved at all). Having bad credit makes it difficult to get approved for an unsecured business loan, but it doesn’t make it impossible. For example, if you’re a startup with some revenue, you could qualify for a business loan without a credit check. However, if you’re still in the startup process and haven’t sold your products or services yet, then you’ll need to improve your credit to qualify. Since startups don’t have a lot of history—or any history at all—for lenders to go off of, you’ll need to make sure you have a sound business plan. Any potential lender will want to see that you’ve thought through the process of what your business offers, what makes it unique to your industry, and how you plan to obtain customers. When creating a business plan, it’s important to include financial projections that show how you plan on using the capital and how you expect the business to perform. Creating the right business plan can be time-consuming, and it can be frustrating trying to figure out what to include. If it’s your first time preparing a business plan, you will have to go through several versions before you produce a plan that lenders will accept. However, there is business planning software that can guide you through the process and help you produce a complete plan quickly. There is technically no down payment required on unsecured business loans. However, some unsecured loans, like SBA loans, require you to invest a certain amount of money in the project or business for which you’re seeking funding, similar to a down payment. For existing businesses, this equity requirement is typically 10%. However, SBA loans for startups can require a contribution as large as 25% to 30%. This shows lenders that you’re personally invested in your business venture. The problem with getting unsecured business funding for startups is that you either don’t have any capital—which is why you’re seeking financing—or your cash flow is probably too tight during the early stages of your business. It’s hard to part with 25% to 30% of the money you need because you don’t know how quickly your revenues will grow, but the alternative is that you’ll have to personally come up with the funds. A good down payment option on an unsecured startup business loan is to use a ROBS, which works well with SBA loans or other financing options. With a ROBS, you can use your retirement funds to pay for your down payment instead of trying to scrape together the funds by emptying your personal savings accounts, selling your assets, or taking on a second loan and further increasing your debt-to-income ratio. A ROBS can help you access your retirement savings without paying early withdrawal fees or taxes, but it can be a complicated transaction. That’s why we recommend partnering with an experienced ROBS professional who can help you navigate the entire process. If you have $50,000+ in a tax-deferred retirement account, you can speak with our recommended provider, Guidant, to learn more. Once you find the right lender and have determined that you’re qualified, it’s time to gather the right documentation and apply. The amount of paperwork you’ll need will be determined by what type of unsecured business loan you’re getting. For example, an SBA loan requires a lot of paperwork, but a business credit card can easily be applied for online with basic information within a few minutes. With personal loans, you’ll typically start by applying online and providing documentation proving you meet the specific lender’s standards. If you meet those standards, your loan will be put through the underwriting process to verify your financial qualifications to repay the loan. The entire process generally takes three to seven days. With a business credit card, you’ll likely be able to apply online by providing basic personal and business information. The provider’s online system will analyze your profile and either immediately give you an approval decision, or they’ll ask you for more information. If approved, you can get your business credit card in three to 10 days. If you’re interested in applying, check out our article on the best startup business credit cards. If you’re interested in checking out the best business credit cards overall, head over to our small business credit card marketplace. It can take 45 to 90+ days for startups to get funded with an SBA loan due to a pretty onerous application process. You’ll likely need to work with a traditional lender who controls the underwriting process. Banks and traditional lenders are notoriously slow to approve loans, and they won’t rush an unsecured startup business loan through by any means. You’ll also likely have to fill out a paper application along with all of this documentation, and you’ll be asked for more detailed information as the underwriting process progresses. With a ROBS, you’ll typically be funded within two to three weeks. Unlike the options above, this isn’t a loan and your personal credit won’t be checked. You’ll start by partnering with a ROBS provider who can help you through the process. Some loans are considered unsecured business loans because they don’t require you to put up physical collateral, like real estate, but the loan is backed by the asset you’re borrowing to purchase. These loans are available to businesses that are new, but not still in the ideation stage. You should have real business assets with some revenue or customer invoices before considering these options. Equipment Financing Businesses needing financing to purchase equipment with a long shelf life. POS Financing Businesses that process a lot of payments through a POS provider like Square. Angel & Venture Capital Founders willing to exchange ownership for capital to scale their business. Equipment financing helps you purchase large pieces of equipment for your business by using the equipment itself as collateral. While this technically isn’t an unsecured loan, you don’t have to personally put up any collateral in order to get approved. If you default, you’ll only lose the equipment you purchased with the money. Equipment financing can be structured as an equipment loan, where you own the equipment at the end of your term, or an equipment lease that lets you use the equipment for your loan period. Both use your equipment as collateral. POS financing is offered by the POS provider that processes your credit and debit card transactions. When you’re processing a certain level of daily receipts, which varies by provider, they will typically offer financing to you. POS financing providers typically lend less than $100,000, and the financing is capped at a certain percentage of the number of receipts you process annually. Repayment terms are typically daily and automatically deducted from your POS revenue by your provider. Learn more by reading our article on Square Capital loans. Angel investors and venture capitalists are individuals or entities that invest in startups in return for a percentage stake in that company. This type of financing is called “equity financing,” and technically isn’t a loan at all. Instead, you effectively sell a portion of your company to an outside investor in return for capital and oftentimes strategic guidance. Angel investors and venture capitalists are really only a viable option for startups that exist to scale quickly and exit for a large sum of money. For most of us, this isn’t a viable option. It is interesting, however, since it requires no collateral or even a personal guarantee, and is instead more similar to an asset sale. For more information, check out our article on the best startup business loans. We have done our best to cover unsecured startup business loans in this article. However, like with any other form of financing, there are always some questions that are asked more frequently than others. If we haven’t answered your question in our article or in the FAQs below, you can ask us a question in our Fit Small Business Forum. Can I get an unsecured business loan with bad credit? It will be difficult to get qualified for an unsecured business loan if you have poor credit. Most low credit, small business loans that have low requirements base funding decisions on business revenue and performance. Fortunately, founders can draw on personal retirement savings with a rollover for business startups (ROBS). Are there other financing alternatives for startups? As an alternative to SBA loans, startups can raise some money from friends and family. For businesses with steady growth, the fastest way to get financing is with an online business lender. If your business is scaling very quickly, you may even consider startup funding like venture capital or angel investors. Are there any nonprofit lenders for startups? Some entrepreneurs may qualify for loans under $50,000, commonly known as microloans. This is often done through larger sponsored programs like the SBA Microloan program. Qualifications will vary amongst lenders, and may require you to fulfill certain job creation or hardship alleviation goals as part of your business plan. While it can be difficult to find an unsecured business loan for your startup, there are options available to you. The best one for you will depend on your creditworthiness, how much funding you need, and how much you have to put down. We understand that unsecured business loans may or may not be right for you, which is why we recommend talking to a startup loan expert like Guidant. They specialize in getting startups funded and can help you obtain unsecured business loans for your business, as well as a rollover for business startups (ROBS), a penalty-free and tax-free way of using retirement savings to fund a startup business.